Marvelous! That tapenade looks delicious. What a beautiful color and combination of flavors. Love this, as neither of us are ripe olive fans. My mouth is watering…LOL that you put the lovely salmon in the background to highlight the “star” here! I don’t have a good green olive tapinade recipe yet, Lynda and this one looks like it would total fit the bill for us. I love the use of almonds instead of pine nuts (did you notice how the price of pine nuts went from marginally nutty to absolutely ridiculous in the last five years?). Bookmarked for sure. I bet that this would make about anything taste great. Thanks again for the inspiration. Oh my goodness. I would love this for dinner! I think I know what you mean, for me. the sauce or topping is often more of a star for many dishes than the main ingredient itself. It’s more like the salmon is the stage here for the flavours of the tapenade to dance on. YUM! I love the sound of this! What an easy and elegant tapenade to pull together before a party, and I bet delicious on top of salmon! Thanks for sharing. Gorgeous photo! It sounds wonderful. As no lover of salmon I am in this for the tapenade, and can totally see myself eating it by the spoonful, or perhaps even the jar full! Love these flavors! This recipe is just what I need to pull me out of my rut of preparing salmon the same old way every time. 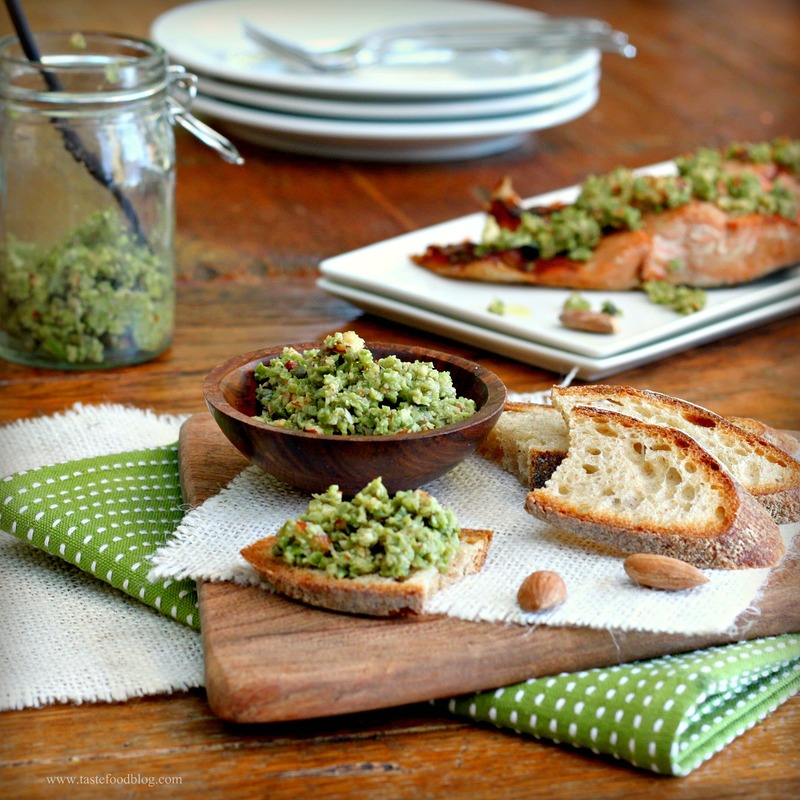 The green olive and almond tapenade must really take the salmon to a whole new level. The Tapenade looks absolutely wonderful!!! Such wonderful combination of flavors..
Wow, so good, this is a great recipe and the photo is stunning. I’ve never made an olive tapenade with green olives- it looks delicious! And the colors in the dish are lovely. But then when it went into my mouth with the salmon, it all came together and the flavors were perfect ! little bonus, I felt like putting a few drops of balsamic vinegar on the bottom of the plate before putting the salmon in and it gives an extra kick from time to time, love it ! !